Saturday & Sunday Open Houses CANCELED. Offer accepted. Room with a view! 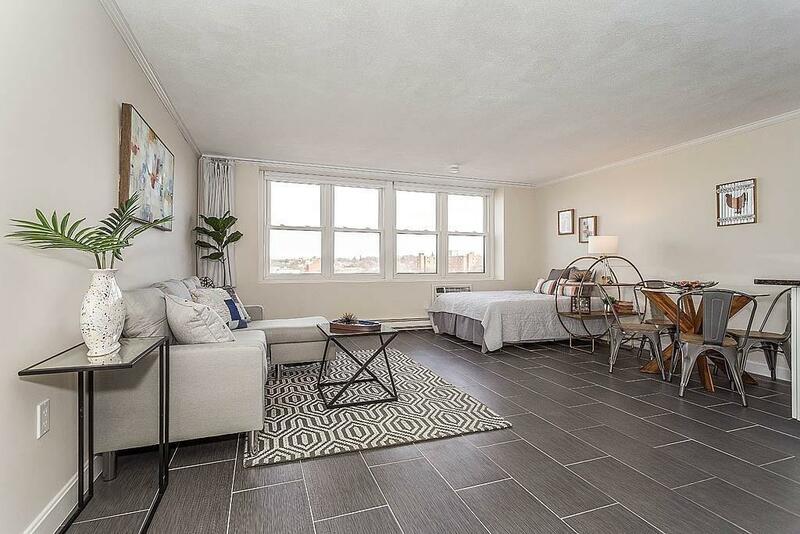 Come see this renovated 5th-floor studio condo with a wall of windows overlooking downtown Melrose. Nothing to do but move right into your new home that's been fashionably updated with neutral colors, contemporary fixtures, and stainless steel appliances. Amenities include the common balcony where you can enjoy outdoor space, extra storage in the basement, one assigned parking spot, and laundry room just one floor down. This property is conveniently located on Main Street in one of the most charming and vibrant cities in Massachusetts. Melrose is in high demand due to its public transportation, proximity to Boston and the North Shore and its popular restaurants, cafes, and shops. Located adjacent to Wyoming Hill Commuter Rail Station, 1.1 miles to Oak Grove, and directly in front of MBTA bus stop for Routes 131, 136 & 137. Offers will be reviewed as they are received, so don't wait to see this fantastic unit.